Council officers have been criticised over "secretive" plans to demolish a major road system and build thousands of new homes. 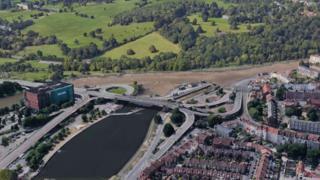 Councillors in Bristol said they are being kept in the dark over plans to knock down the Brunel Way system in Cumberland Basin. Officers have given engineering consultants Arup "free rein" to assess 10 options to redevelop the area. But they have insisted plans would be released by the end of March. The 10 options are now being whittled down to the final four, with at least 2,000 new homes, offices and leisure facilities in the pipeline. At least one option on the shortlist for the area to be renamed the Western Harbour would include a new road tunnel. Liberal Democrat councillor Mark Wright demanded to know why members of the growth and regeneration scrutiny commission had to "keep dragging every bit of information out of the council on this". "It's not usually quite so secretive about the reports. People are wondering what was in the brief," he said. Executive director Colin Molton said the existing road system was "probably now approaching the end of its economic life". "We have to make decisions on whether we spend a large amount of money every year on maintenance required for this network or whether we start to think about alternative solutions." Mr Molton said "at least one tunnelling" option, earmarked for the western side of the site, would be on the shortlist of four schemes.